Avast, Watson! 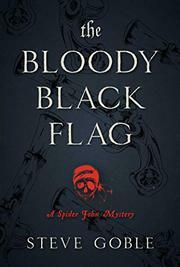 Journalist Goble’s fiction debut sets its murder mystery aboard an 18th-century pirate ship. Narrowly escaping first the shipwreck of the Lamia and then the wrath of one of the wreck’s few other survivors, carpenter Spider John Rush and his blood brother, Ezra Coombs, accept an offer they’d spurned only hours earlier, seeking to elude further dangers in Massachusetts Bay by joining the crew of the Plymouth Dream. They duly sign the ship’s articles, accept the work Capt. William Barlow assigns them, and bed down in the expectation of more adventures. But Ezra’s adventures are ended the next night, along with Spider John’s hopes of peace, by the man who clubs Ezra to death and leaves a pewter tankard close by to suggest he got drunk and fell. Spider John, who knows that Ezra didn’t drink and that an accidental fall wouldn’t have left two distinct head wounds, vows to avenge him, well aware that he faces some unique challenges. Of the 70 crewmen aboard the Plymouth Dream, all are lawbreakers, most are killers, and every single one’s a reasonable suspect. In addition, Ezra’s unfortunate reputation as a witch’s son, which followed him to his new berth and perhaps caused his death, guarantees to make anyone investigating that death deeply unpopular. Even so, Spider John, determined to get to the truth of the killing, begins to make cautious inquiries among the pirate crew—inquiries that will be interrupted by the Plymouth Dream’s battle with another ship, a forced search for a mysterious brass cylinder, a mutiny, and the intermittent pursuit of the ship by one of His Majesty’s frigates. The mix of pirates and detection works surprisingly well. If the guilty party is no great surprise, both the mystery and the sleuthing are neatly turned. First of a series.